I asked them both how they would describe one another. I would describe Jared as my perfect match, easily. He knows exactly what to do or say to make my day turn around. With just the sound of his voice, or a simple text he can make me smile. He encourages me, makes me laugh and will do anything to make me happy. He genuinely loves me and I can tell by everything he does. He is loving, caring, hilarious, fun to be around and has a contagious smile. He is my best friend and my better half. I cannot imagine my life without him, and I cannot wait to start my life with him! She is my perfect compliment. Everything I lack she makes up for and then some! She is beautiful and brilliant. She is athletic, energetic and funny. She is kind and loving to all those around her. She is a woman of unwavering faith and able to face any difficulty because of it. Brittany is able to uplift any heart and brighten anyone's day better than anyone I know. She is encouraging; making me feel like I am the greatest man in the world who can accomplish anything. She is the best friend I could ever hope for. Then, I asked them, What are you looking forward to the most about your wedding day? "I am looking forward to starting a lifelong journey with my very best friend. I am excited about walking down aisle, seeing Jared's face as I walk towards him as his fiance and leave with him, as his wife. I am happy to be surrounded by my family and friends throughout the day celebrating the marriage of Jared and I. I am excited about everything that will happen on that day, but ready to start my life with Jared." All of it! But the most would be seeing my gorgeous bride walking towards me at the ceremony. Seeing her in her dress, with all eyes on her. No one will be happier than me in that moment. Their wedding day was full of love and they got that sweet moment they talked about above. 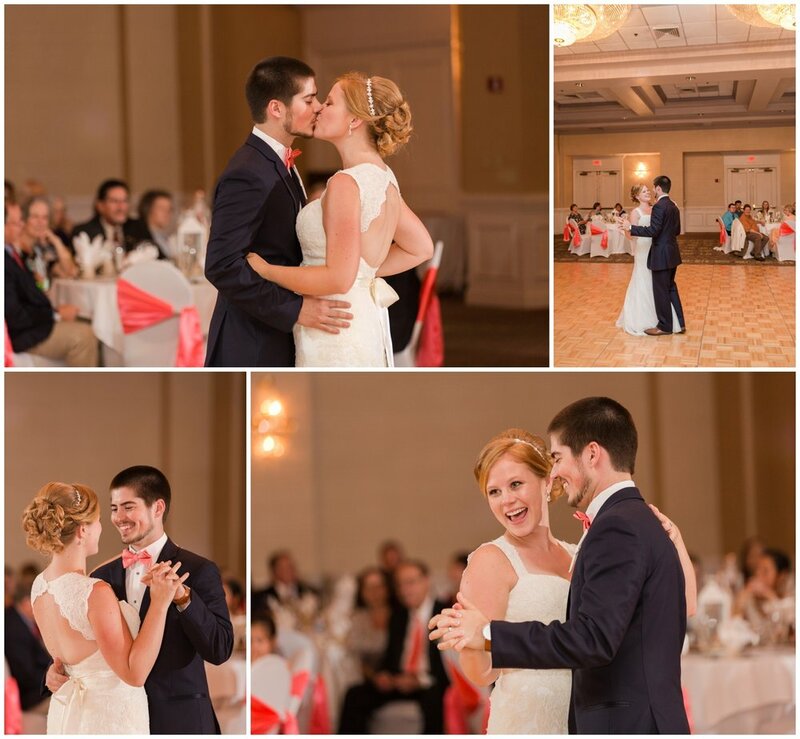 As Brittany walked down the aisle to Jared they were both ALL SMILES! Brittany and her family planned a beautiful coral and navy themed wedding at the Wyndham Virginia Beach Oceanfront Hotel. They were surrounded by all of their closest friends and family as they celebrated their perfect union as man and wife!